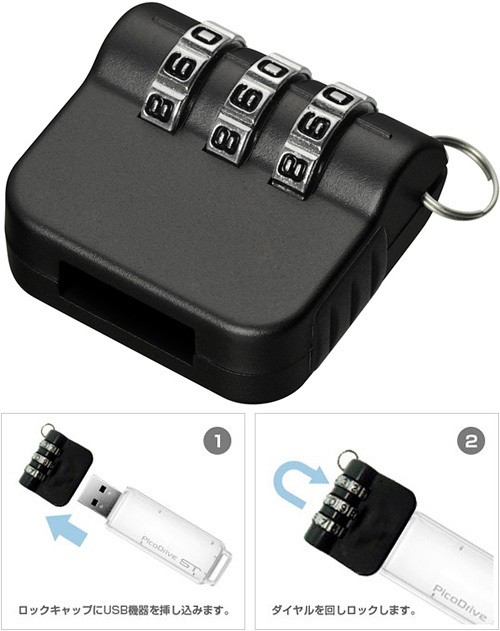 Combination Lock For USB Flash Drives | OhGizmo! By Andrew Liszewski on 01/28/09 • Leave a comment! Why go to the trouble of encrypting the data on your USB flash drive when you can simply slap a lock on the business end, preventing other people from connecting it to their PCs in the first place? That’s exactly what this combination lock does, and while you still have to memorize a password/combination to access your files, it’s just 3 numbers long. Wait, what’s that you say? Thanko has already been selling a similar USB lock for almost a half a year now? Well this version, from GREEN HOUSE, improves on their model by coming in your choice of black, white or silver finishes. So it looks like Thanko has just been taught an important lesson when it comes to innovation. You just can’t sit back and rest on the laurels of a product that only comes in one color. And thank you GREEN HOUSE for providing a much improved solution.